January 20, 2016 – A mission nearly 10 years in the making, New Horizons left Earth on January 19, 2006. Speeding through the Solar System at more than 50,000 miles per hour, the spacecraft completed the first ever flyby of dwarf planet Pluto on July 14, 2015. On the three billion mile journey, New Horizons came within 1.4 million miles of Jupiter, crossed the orbits of Saturn, Uranus and Neptune and successfully became the first manmade spacecraft to reach Pluto, coming within 7,750 miles of the surface and taking the first high-definition photos of the dwarf planet. In recognition of this accomplishment, the Space Foundation will present the Pluto New Horizons Exploration Team with the 2016 John L. “Jack” Swigert, Jr., Award for Space Exploration. The 2016 Swigert Award will be presented April 11 during the opening ceremony of the 32nd Space Symposium at The Broadmoor in Colorado Springs, Colorado. The ceremony is co-sponsored by Northrop Grumman, and the award is given annually by the Space Foundation to the person or organization that has made the most significant accomplishments in advancing the exploration of space during the previous year. The John L. “Jack” Swigert, Jr., Award for Space Exploration honors astronaut Jack Swigert, a Colorado native who served with retired U.S. Navy Captain James A. Lovell, Jr., and Fred Haise on the legendary Apollo 13 lunar mission, which was aborted after the perilous rupture of an oxygen tank en route to the Moon. People around the world watched as NASA overcame tremendous odds to return the crew safely to Earth. Before joining the Apollo program, Swigert was a combat pilot for the U.S. Air Force in Japan and Korea and an engineering test pilot for North American Aviation, Inc., and Pratt and Whitney. In 1982, he was elected to the U.S. House of Representatives, but died of cancer before taking the oath of office. 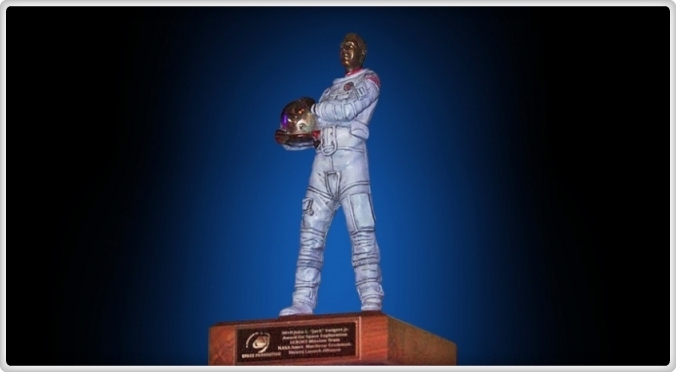 The Space Foundation, founded in 1983 in part to honor Swigert’s memory, created the Swigert Award in 2004 in tribute to his lasting legacy of space exploration. The Space Symposium is the annual gathering of all sectors of the global space community, to be held April 11 – 14 at The Broadmoor in Colorado Springs. Visit www.SpaceSymposium.org to see the agenda and other speakers, and for secure online registration, meal tickets and secure lodging reservations.